Since the DCMS Creative Industries Mapping Document highlighted the key role played by creative activities in the UK economy and society, the creative industries agenda has expanded across Europe and internationally. They have the support of local authorities, regional development agencies, research councils, arts and cultural agencies and other sector organisations. Within this framework, higher education institutions have also engaged in the creative agenda, but have struggled to define their role in this growing sphere of activities. Higher Education and the Creative Economy critically engages with the complex interconnections between higher education, geography, cultural policy and the creative economy. 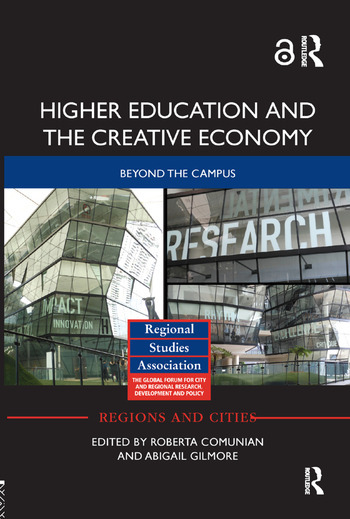 This book is organised into four sections which articulate the range of dynamics that can emerge between higher education and the creative economy:　partnership and collaboration across Higher Education institutions and the creative and cultural industries; the development of creative human capital; connections between arts schools and local art scenes; and links with broader policy directions and work. While it has a strong UK component, it also includes international perspectives, specifically from Australia, Singapore, Europe and the USA. This authoritative collection challenges the boundaries of creative and cultural industry development by bringing together international experts from a range of subject areas, presenting researchers with a unique multidisciplinary approach to the topic. This edited collection will be of interest to researchers and policy makers working in the area of creative and cultural industries development. Roberta Comunian is Lecturer in Cultural and Creative Industries at the Department for Culture, Media and Creative Industries at King's College London, UK. Abigail Gilmore is Director of the Centre for Arts Management and Cultural Policy at the University of Manchester, UK.